What do most people look for when buying salmon? Not size or fat content. Most look for color. Since the fish is known for its distinctive pink hue (a hue often referred to as “salmon”), darker salmon sells better. 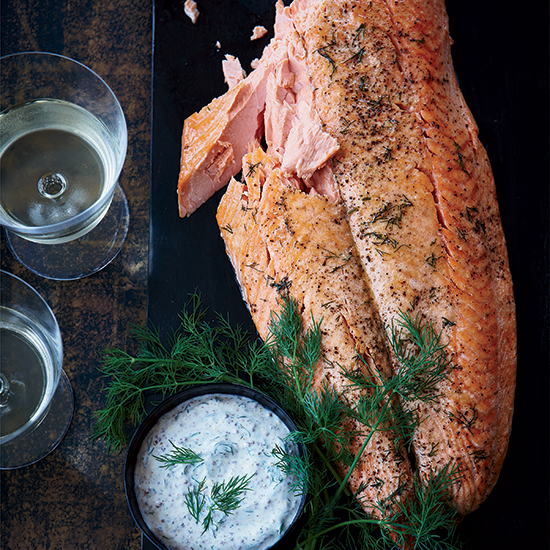 But for farm-raised salmon, which makes up 70 percent of the market, color has nothing to do with quality. Farm-raised salmon is naturally gray; the pink color is added. Also added to this kibble is astaxanthin – sometimes created naturally, but often created in a lab. Farmers can go so far as to determine how pink their salmon will be based on how much astaxanthin give the salmon. One company, DSM, even offers up “SalmoFan” – a numbered, color reference tool similar to what you find when buying house paint that helps farmers measure just how red their fishes’ flesh color is. Possibly most surprisingly of all is that “pigmenting supplements are the most expensive component of the farmed salmon diet, constituting up to 20% of feed costs,” Quartz.com writes. But pigmenting pays for itself in profits. According to one study, poorly colored farm salmon would be “difficult to sell at any price,” making the coloring a must. Quartz.com concludes by suggesting that if more people were aware of this phenomenon, farmers could cut out the big coloring expense, potentially selling gray salmon at a lower price (and removing any possible negative effects of loading up our fish with artificial colors). Or, you know, they could start dressing salmon up in tuxedoes and sell them for much, much more.